As the brothers of Pi Kappa Alpha breeze through another set of mid-terms, the end of the semester is right in front of our eyes. In the rearview are the past six months. It has been an eventful summer and semester since we have last updated. Over the summer we had over ten of our brothers represent PIKE overseas for study abroad opportunities, mission trips, and vacations. Crusade for Children's Firefighters Challenge! Just this month the brothers of Pi Kappa Alpha strapped on their gloves and took part in our annual charity event benefitting The Crusade for Children. We invited people out to take part and donate to the event, with activities including: volleyball tournaments, fire hydrant ringtoss, the fire truck pull, among others. As another Spring Break passes the members of this fraternity did not want to leave each others side. A big group of brothers and students of the university headed down to Daytona Beach. We found ourselves soaking up the sun and making life long memories. Whether it was being on the beach, participating in contests, or even cheering on the Cards in the tournament; we found ways to enjoy our 2015 spring break. Cause we all know Once a Pike, Always a Pike! As we take a stand for something bigger than ourselves we find a way to enjoy it. Many brothers took their time to participate and make a difference this month. We as a fraternity were able to raise money and donate it to an amazing cause that helps fight for a cure against Pediatric Cancer. I can’t imagine another group of men that are devoted to making a difference in this world then this group of men I get to call my brothers. These moments are the ones you will remember for a lifetime. March 1, 1868. This was the day that Pi Kappa Alpha was founded at the University of Virginia. We we’re able to get together as brothers and celebrate our founding at Mellwood Art Center here in Louisville. It was awesome to see all the alumni who came out and supported us! This year we had a silent auction along with also giving out some awards. PIKE stands by the acronym S.L.A.G. which stands for Scholars, Leaders, Athletes, and Gentleman. An award was given to the Scholar of the year, the Leader of the year, the Athlete of the year, and the Gentleman of the year. Then the other two awards that were also given out were PIKE of the year and also Alumni of the year. This month we wanted to take the time and honor our alumni brother Steven Vanover. We unfortunately had to say our goodbyes to him this past month. He was a very outstanding man who was very hardworking and fun to be around. He passed away this month from a battle with cancer. We ask that you please have his family and friends on your mind, Thank You. 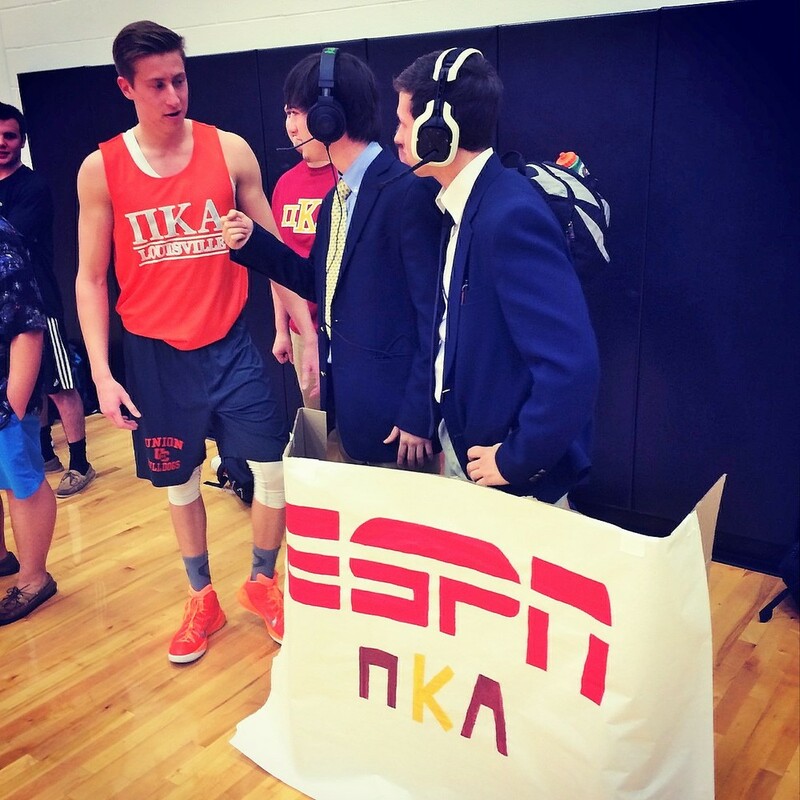 This season of intramural basketball has been full of excitement and laughs. For every game we have had a huge fan-base on the sidelines and they are only getting bigger. We have started to create themes for these game and it has been a huge success. A few of our New Members came out and supported us as broadcasters as we put a stomping on TKE. These events are one of our best ways to get school out of our mind for a bit and cheer on our brothers to victory! Time and time again we come together to show our mothers how much they mean to us. We had another successful Mother Son event thanks to our loving mothers and brothers. We wouldn’t be where we are today without your love and support, so we want to thank you from the bottom of our hearts. We appreciate everything you do for us and this is one way we love to show you our gratitude. The annual Fryberger competition has just passed and once again PIKE put on another memorable show. As a chapter we are very familiar with doing well in this competition year in and year out. We took the stage once again and made the crowd went crazy, we performed our routine (Magic PIKE), and to say the least no one in the crowd knew what was coming. This is always an amazing time spent working hard and goofing off with your brothers. It really helps put our creativity into play, if you have never been to a Fryberger I highly recommend coming to a show. The Taylor Trudeau Cycle for Life Philanthropy event was created in memory for a fellow Brother from the University of New Hampshire at the Gamma Mu Chapter of Pi Kappa Alpha. After a year-long battle with Leukemia, he passed away in August 2008, the brothers of Gamma Mu decided to create a stationary bike marathon in order to raise money and awareness for Leukemia, Lymphoma, and Melanoma blood cancer research. This year the Kappa Zeta chapter will be holding its second event on March 28 from 2-6pm on the third floor of the Student Recreation Center. Last year we raised $1,500 with several campus groups participating. This year we hope to double the participation and raise at least $3,000. 130 PIKE chapters nationally have raised $250,000 to fund Phase 1 of a clinical trial. For more info please visit the Cycle for Life Foundation webpage at http://taylorcycleforlife.org/ and be sure to visit our personal page at http://taylorcycleforlife.org/chapters/university-of-louisville or contact Billy Mitchell the current Philanthropy Chairman at William.mitchell@louisville.edu. This semester our brother Alex Stewart ran for a huge campus position. He ran against many great opponents for the position of Academic Vice President. Stewart is one of the most dedicated men I know and a brilliant one at that. No matter the position or role he acquires, he finds a way to improve it in some sort of manner. We as a chapter are very proud of Brother Stewart's accomplishments and victory at winning Academic Vice President. Kappa Zeta soaking up the rays in Myrtle Beach, SC, during Formal. Greetings, Parents, and thank you for checking out this month's update! October has been quite a busy month, with Fall Break, mid-terms, and the like. It would be natural to assume that Greek activities would slow in response to academic pressure. However, the members of Kappa Zeta have remained active in spite of it all. Brother Shelby LaFollette with his father Wendell at Parent's Day Tailgate. First, some thanks are in order. Kappa Zeta would like to thank all the parents and sisters of Chi Omega for an awesome turnout at our Parent's Day Tailgate! The weather was perfect, the food was nice, but--more importantly--the Cards pulled out a win against Wake Forest! We hope that everyone had a good time, and we hope we were able to show how much we appreciate everything you've done for us. Also on the subject of tailgate, Saturday, October 18th, was the date of Kappa Zeta's Alumni Tailgate. This was Kappa Zeta's chance to show the sizable network of greater Louisville alumni our appreciation for their contributions to this chapter, as well as celebrate their accomplishments after graduation. Although it was a bit cloudy and cold, we'd like to thank those in attendance for 'bro-ing out' to see another win for the Cards. Alumni Andrew Becht, Jamie Alvey, David Osborne, Keena Westmoreland, Mitchell Buller, and Chris Downs at Alumni Tailgate on 10/18/2014. This month saw the first major promotional event for UofL's biggest philanthropic event, raiseRED Dance Marathon. Mr. and Ms. raiseRED is a pageant, in which the various fraternities and sororities on campus elect a representative to compete. Winners are selected based upon how well they represent the ideals tied to the event, and are expected to serve as ambassadors for the organization in the weeka and months preceding the event. This year, Pi Kappa Alpha chose brother Evan Oberhausen to represent us onstage. We'd like to thank him for stepping up, and commend him for the stellar Napoleon Dynamite routine. Brother Oberhausen emulating everyone's favorite nerd during the talent portion of Mr. and Ms. raiseRED. "PIKE's Fireman Challenge is a fundraiser for the WHAS Crusade for Children, which is currently in its 61st year of benefiting children in 120 counties of Kentucky and 50 counties of Southern Indiana. It is not-for-profit public charity 501(c)(3) organization that assists children with special needs. The Fireman Challenge is a team based competition in which teams attempt to pull a 1950’s fire truck 25 feet down Fourth Street LIVE for the fastest time. The winning team of each category will be presented with an award. If you are able to get a team of eight together and would like to participate, the registration fee is $100 per team. Brothers of Kappa Zeta at last year's Fireman Challenge. The Robert Adger Smythe award is given each year to the top 10% of Pike Chapters nationwide. This is the second consecutive year Kappa Zeta has earned such an honor. The chapter would like to thank all brothers of Kappa Zeta, past and present. Without your work and dedication, this honor could never have been achieved. (From left) Brothers Tyler Thompson, Shelby LaFollette, Erik Eaton, and Eric Thompson at the Pike International Conference in Baltimore, where the Smythe is awarded. This upcoming weekend celebrates UofL's annual Family Weekend. As a gesture of grattitude toward our parents, the ladies of Chi Omega are joining with the members of Pi Kappa Alpha to put on our first combined Parents' Day Tailgate. Directions: From Papa John's Cardinal Stadium, take Central Ave (street that forms the bridge directly in front of the stadium) east, which would be the opposite direction of Churchill Downs. At the intersection of Central Ave and Crittenden Drive, continue straight. You should see a line of tollbooths, which means you're in the right place! You are not required to bring additional food and drinks, for they will be provided. However, feel free to do so if you wish! Greetings! Welcome to our new website, and thank for taking a monent to read our first Parent Newsletter of the '14-'15 Academic Year. Last year was a banner year for the Kappa Zeta chapter, but this one has already seen many exciting developments. The accomplishments of years past have allowed Kappa Zeta to continue its tradition of excellence, and we seek to do so well into the forseeable future. September 10th and 11th, the final two days of Fall Rush, saw thirty-eight young men sign a bid to join the Kappa Zeta chapter of Pi Kappa Alpha. Its members include Jack Hagan, Jonathan Wilburn, Grant Kuether, Drew Joers, Kristian Meyer, Chris Bird, Paul Barnett, William Fooks, Phillip Lentsch, Andrew Oyler, Andrew Hebert, Grason Bender, Matthew Melander, Austin Etzel, Reese Tannhauser, Camilo Martinez, J.B. Allen, Greg Rice, Nick Brandel, Samuel Gaba, Ajdin Pasanbegovic, Jacob Hogget, Jonathan Lynch, Jasmin Karahausic, Richard Dickerson, Andrew Proudfoot, Lucas Hartgrove, Justin Quinlisk, Bandon Abrams, Freddy Martin, Ben Watkins, Brad Flynn, Alexander Barnum, James Morris, Neal Stansel, Chris Lewis, Korri Woods, and Connor Layne. Members of the Alpha Omicron pledge class. The Kappa Zeta chapter is very excited for our new pledge class, and we anxiously await the day these men become part of this fraternity's tradition of excellence. We are very excited for the launch of our new website! After months of hard work it is finally in tiptop shape to show off to all of you awesome Pi Kappa Alpha - Kappa Zeta fans. This is a great way for parents and friends alike to keep up to date with all of the fun activities the U of L PIKES are up to. Look around the site and be sure to check the blog often for new updates.